For me my ultimate skincare goal is always to have glowing skin. In my opinion when skin glows it means that it's well moisturized, healthy, and clear. I also believe that clear glowing skin is the most important thing for makeup application and that a good makeup look always starts with good skin. Recently I've been able to really focus on achieving that glowy look I always love. I've finally settled on a few products that have been helping me to achieve the look I want. I have been able to pinpoint exactly what products I'm using that make my skin glow and I want to share them with you along with a few tips and tricks that I use too. 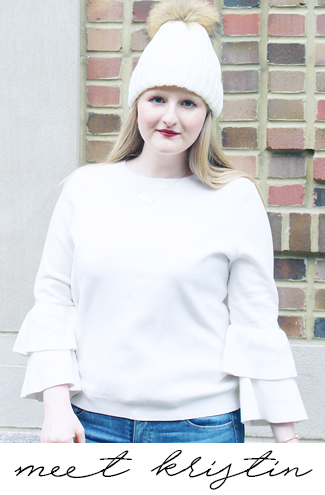 There are four main parts to my glowing skin tips, which are exfoliate, treat, mask, and moisturize, plus the products I use during the daytime. The two most important things that I've found to achieve glowing skin are definitely exfoliating and moisturizing. Without exfoliating my skin becomes rough, dull, and doesn't look its best. This is one step you cannot skip. 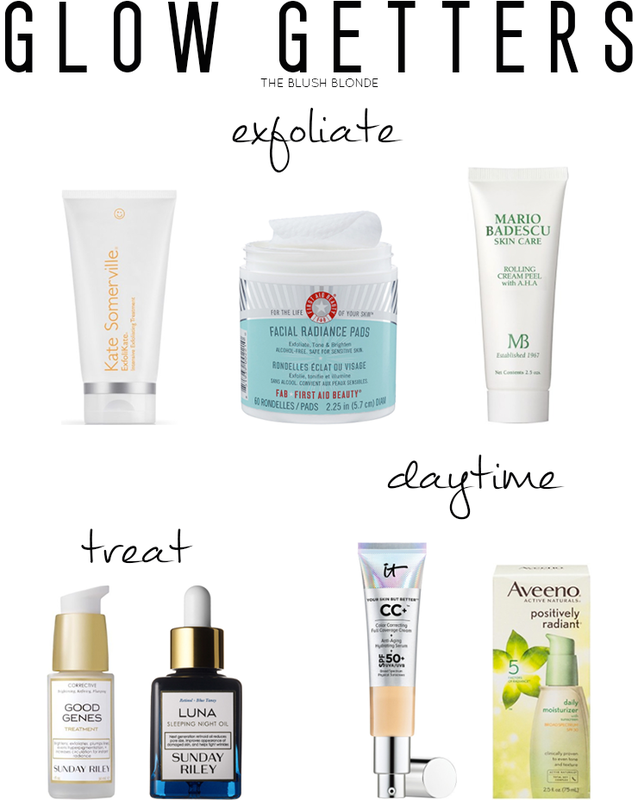 For more tips on exfoliation and help picking the best one for your skin check out this post. Kate Somerville ExfoliKate- It is necessary to have a physical exfoliator on hand like this one from Kate Somerville. Physical exfoliants slough away dead skin to reveal a brighter complexion. While I am a huge fan of this product it is pretty pricey so I also recommend this and this. First Aid Beauty Facial Radiance Pads- I've raved about these countless times on here, but I truly think these are the number one reason my skin is glowing. I use these at night between cleansing and applying treatments and/or cream and they work to gently exfoliate and tone skin. I notice a huge difference when I don't use these and highly, highly recommend them. Mario Badescu Rolling Cream Peel with A.H.A.- This is a chemical exfoliant, which uses ingredients to dissolve dead skin cells on the face. I love this because it's super fun to use - you apply a thin layer, wait a minute, and then roll the cream off and all the dead skin comes with it. I like to alternate this with a physical exfoliant. Treatments and serums can help your skin in many ways. They can work to further exfoliate the skin, tighten pores, deliver ingredients such as antioxidants, and deeply moisturize the skin. In my opinion the Sunday Riley treatments I have pictured above were huge game changers for my skin and a very important part of my glowing skin regimen. Sunday Riley Good Genes- This is my second favorite product for glowing skin. It is a a pharmaceutical-grade, lactic-acid-based treatment that works to exfoliate, plump fine lines, reduce hyperpigmentation, increase circulation, and firm skin for instant radiance. It also helps to clear up any blemishes or breakouts that you might experience. I always wake up with almost perfect skin anytime I use this! Sunday Riley Luna Sleeping Night Oil- This is a retinoid oil that moisturizes, shrinks pores, reduces wrinkles, calms redness, and improves skin smoothness. The pores on my skin always look significantly smaller after using this and it does a great job at hydrating my skin. During the day I like to use products that highlight my skin instead of covering it up. Since my skin tends to get very dry moisturizing during the day (especially in the winter months) is super important to keep my skin looking its best. I also prefer to use a BB or CC Cream instead of foundation as they cover up any imperfections, but provide a lighter coverage. I always apply the BB or CC Cream with a damp makeup sponge after a basic moisturizer to keep my skin looking dewy. Aveeno Positively Radiant Daily Moisturizer- This is an oil-free, hypoallergenic and noncomedogenic moisturizer. My favorite part about the Positively Radiant Daily Moisturizer is that in addition to the Total Soy Complex it also contains natural light diffusers, mica and silica, to even skin tone and texture while reflecting light to visibly smooth imperfections. When I put on the moisturizer I literally feel like my skin glows from within. It Cosmetics Your Skin But Better CC Cream- This covers up any skin issues while still looking natural and a little product goes a long way. It hydrates, smoothes skin, and enhances brightness. There's a reason why this receives so many awards and rave reviews. I have seen a huge difference in my skin since I began using masks a minimum of twice a week. Masking is like a treat for your skin and you typically see both instant and long term results from them. I love both normal and sheet masks and I alternate between using the two. Masks are a great way to boost your glow and make your skin even more radiant. Primary Raw DoYou 2 Step Milk Peeling Kit- This two step kit involves exfoliating with a gentle lactic acid exfoliant and then applying a soothing sheet mask. I have brought this five or six times because I love it so much. This is especially great if your skin needs a major dose of exfoliation and moisturizer. Too Cool For School Egg Cream Mask Hydration- This is another mask that I've purchased numerous times. It brightens and hydrates the skin using egg extracts, coconut water, niacinamide, and other botanical extracts. It is actually so popular that it's completely sold out at Sephora right now! First Aid Beauty Facial Radiance Overnight Mask- As an overnight mask this is both a mask and a moisturizer. It deeply moisturizes and nourishes skin, while also brightening. Apply this at night after cleansing, massage into skin, and wake up with gorgeous, radiant skin. Boscia Sake Brightening Hydrogel Mask- I really love this sheet mask because it is made from hydrogel and it fits the contours of the face better than a paper mask. It uses sake, antioxidants, peptides, and plant extracts combined with marine collagen to reduce hyperpigmentation and protect against free radicals. The sake also hydrates and brightens the skin. First Aid Beauty 5 in 1 Bouncy Mask- This has the coolest texture I've ever seen in a mask and is literally bouncy. This mask nourishes, calms, firms, plumps, and refines skin. It uses rose bud extract, marine botanicals, vitamin C, and pepha tight. It is the perfect pick me up for your skin and leaves your skin looking refreshed. After exfoliating moisturizing is the most important component in achieving glowing skin. I can tell a huge difference in my skin if it hasn't been properly moisturized, it looks dry, dull, and dehydrated and anything but glowing. I like to use a combination of skin creams and natural oils to moisturize and use a lot of both because my skin is very dry. Even if your skin is normal, combination, or oily though it is still important to moisturize so that you skin stays properly hydrated. Jojoba Oil- This is one of the best moisturizers for all skin types. It mimics skin's natural sebum and therefore moisturizes skin like it's own natural oils would. Mario Badescu Aloe, Herbs, and Rosewater Facial Spray- You need this spray in your life. It is a great way to boost hydration and radiance throughout the day. It calms and soothes skin and is especially important during the drying winter months. I spritz it on throughout the day to refresh my skin and at night before bedtime to give a quick dose of hydration. Sunday Riley Tidal Brightening Enzyme Water Cream- This cream contains two types of hyaluronic acid to drench the skin in water and moisture; it also contains papaya enzymes, which smoothes and exfoliates. This pairs really well with Good Genes and Luna Oil to give you hydrated, glowing skin. Coconut Oil- Coconut oil has many uses in beauty, but I love to use it on my face when my skin is really dry. Whenever I use this to moisturize I wake up and my skin feels and looks amazing! Argan Oil- This oil is rich in lipids and vitamin E and is intensely moisturizing. Whenever I use this I always see a serious improvement in moisture levels and the condition of my skin. It is by no means necessary to purchase all of these products to achieve glowing skin, but I wanted to share all the products that I'm loving and that have helped me. Picking one product from each component of the routine to use consistently and just taking really good care of your skin will go a long way towards achieving that coveted glow. One last tip I have is to drink lots of water (seriously as much as you can) because this can greatly help to improve and hydrate your skin! 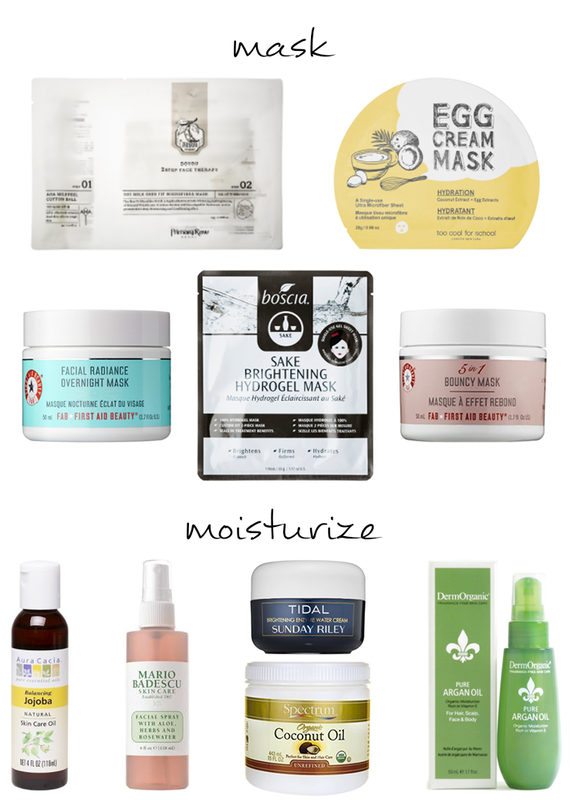 I've been dying to try that First Aid Beautiful facial radiance mask! I definitely want to get into some Sunday riley products, I wish they weren't so expensive. I've heard great things about First Aid Beauty! Must try these products! I'll have to check these products out! I have heard so many great things about the Kate Somerville line... need to check it out! The IT Cosmetics CC Cream is what I'm currently using and loving. It gives an extra dose of much-needed hydration and helps to even out my skin-- LOVE! I need to check out a few of your other picks-- this list is fantastic!